(Nanowerk News) The remarkable ability of an electron to exist in two places at once has been controlled in the most common electronic material – silicon - for the first time. The research findings - published in Nature by a UK-Dutch team from the University of Surrey, UCL (University College) London, Heriot-Watt University in Edinburgh, and the FOM Institute for Plasma Physics near Utrecht - marks a significant step towards the making of an affordable "quantum computer". According to the research paper in Nature the scientists have created a simple version of Schrodinger's cat – which is paradoxically simultaneously both dead and alive - in the cheap and simple material out of which ordinary computer chips are made. The electron motion in silicon. 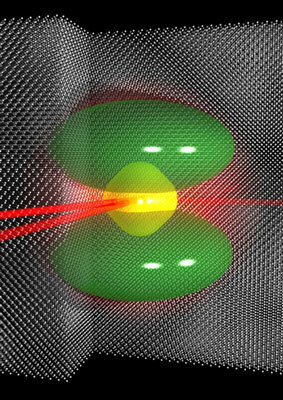 The electron orbits a phosphorus atom embedded in the silicon lattice, shown in silver. The undisturbed electron density distribution, calculated from the quantum mechanical equations of motion is shown in yellow. A laser pulse can modify the electron's state so that it has the density distribution shown in green. Our first laser pulse, arriving from the left, puts the electron into a superposition of both states, which we control with a second pulse, also from the left, to give a pulse which we detect, emerging to the right. The characteristics of this 'echo' pulse tell us about the superposition we have made. "This is a real breakthrough for modern electronics and has huge potential for the future," explained Professor Ben Murdin, Photonics Group Leader at the University of Surrey. "Lasers have had an ever increasing impact on technology, especially for the transmission of processed information between computers, and this development illustrates their potential power for processing information inside the computer itself. In our case we used a far-infrared, very short, high intensity pulse from the Dutch FELIX laser to put an electron orbiting within silicon into two states at once - a so-called quantum superposition state. We then demonstrated that the superposition state could be controlled so that the electrons emit a burst of light at a well-defined time after the superposition was created. The burst of light is called a photon echo; and its observation proved we have full control over the quantum state of the atoms." And the development of a silicon based "quantum computer" may be only just over the horizon. "Quantum computers can solve some problems much more efficiently than conventional computers - and they will be particularly useful for security because they can quickly crack existing codes and create un-crackable codes," Professor Murdin continued. "The next generation of devices must make use of these superpositions to do quantum computations. Crucially our work shows that some of the quantum engineering already demonstrated by atomic physicists in very sophisticated instruments called cold atom traps, can be implemented in the type of silicon chip used in making the much more common transistor." Professor Gabriel Aeppli, Director of the London Centre for Nanotechnology added that the findings were highly significant to academia and business alike. "Next to iron and ice, silicon is the most important inorganic crystalline solid because of our tremendous ability to control electrical conduction via chemical and electrical means," he explained. "Our work adds control of quantum superpositions to the silicon toolbox."